This is a universal fit part; it may or may not fit without modification. Same as the current grips on my bike. Need to replace the grips on my bike and these seem like a good value. Super comfortable, simple, tasteful, durable and not expensive. Because it looks nice with dual density material. Are these grips open ended because I want to replace my old grips but i also am installing bar end mirrors? BEST ANSWER: Yes they are open ended. I highly recommend these grips. They have a Gel like softness to them but are still stiff enough to give you sensitivity. They have been on my race bike for about a year and are holding their form and sensitivity. Good luck and remember to ride it sideways. Yes they are open ended. I installed my yoshi bar ends on my gixxer. Yes they are. I installed them on my Triumph with Throttle Meisters. Yes they are open-ended grips so you can add bar ends to you bike. They are closed, but you can cut them if you want to. I need to replace the grips on my 1996 Aprilia RS250 but I can't seem to find what size it needs. I'm interested in these and would like to know if they will fit on my bike? BEST ANSWER: I think it's safe to say the large majority if not all sport bikes will have the same bar thickness. 3/4". I ride a 2012 ninja 650 and when I saw these grips on rev zilla I liked the simple clean design. They are made in Italy and are nice quality. The package they come in are really easy to open and close if you need to send them back. If I were you I would take one of the grips and slide it onto the clutch side handle bar. For me it was easy to slide on. No vasoline or anything needed. There was wiggle room. If you have the same results then they still fit nice and right on the throttle side. I used vasoline to slide the grip over the thicker throttle side and left it. No needed for glue on the throttle side. It's a tight fit. Have to glue the clutch side and squeeze it so it grand the bar and drys without any loose areas. I would recommend these grips. The rubber is grippy too. measure handle bar pipe size and once u got that the company 9REVZILLA OR GRIP tech) should be able to tell u what size grip u need. measure your grips for length. The diameters are the same. Will these fit 2001 Kawasaki ZRX??? BEST ANSWER: Yes, I believe all of the last few generation have the same bar thinkness. Do these work with the heated grips on a 2007 R1200s? BEST ANSWER: I installed these grips on a BMW K1200Gt with heated grips and they work great. Be caustious when removing the old grips as not to cut the heating element. I used a pair of wire cutters rather than a razor knife so I would not cut the heating wires attached to the handlebar. Good Luck. Only took about 10 minutes for the install. I used hair spray inside the new grips which made them easier to slide on, and once it evaporated the grips were tight. I don't see why it wouldn't. Just have to slide the new grips over the wires for heating on your bike. Use Vaseline for the throttle side. Only glue the clutch side. will this fit correctly on Ducati monster 696 ? BEST ANSWER: Yeah these grips works perfectly. I use these on my 07 GSXR 1000 and my 05 Ducati monster s2r. Great soft rugged grips for street or track days. 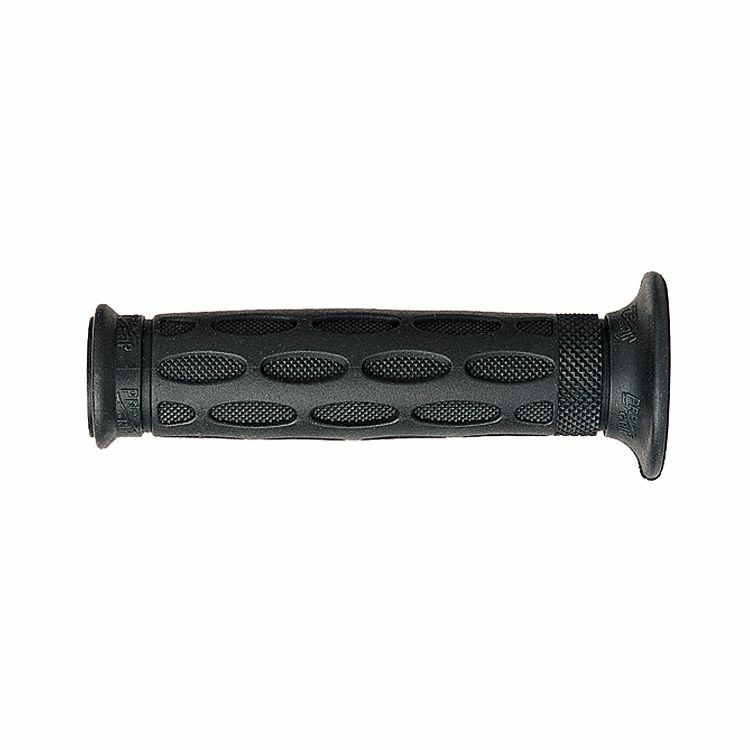 This set of grips should fit your bike. They are open on both ends. will these fit on my 2007 kawasaki zzr600 ? BEST ANSWER: Can't say. but it seems that the grip and throttle sizes between bikes may be standard. These are 22mm left and 24mm right. the inside flip the wide flange of you grip back and the sizes are likely stamped into the rubber. good luck as these are great grips. Are these a direct fit on an 08 CBR600rr or will it need cutting? BEST ANSWER: Yes, use an air compressor and they slide right on. Will these fit on a 2011 GSXR 600? How about fit on the throttle side? One reviewer said some of the throttle plastic shows after installation.